For the village of Nadiş in Sălaj County, Romania, see Cehu Silvaniei. 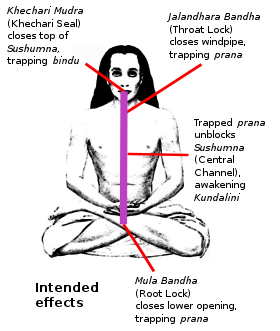 A simplified view of the subtle body of Indian philosophy, showing the three major nadis or channels, the Ida (B), Sushumna (C), and Pingala (D), which run vertically in the body. Nāḍī Sanskrit: नाडी, lit. 'tube, pipe'; Tamil: நாடி, lit. 'nerve, blood vessel, pulse' ( listen)) is a term for the channels through which, in traditional Indian medicine and spiritual knowledge, the energies such as prana of the physical body, the subtle body and the causal body are said to flow. Within this philosophical framework, the nadis are said to connect at special points of intensity, the chakras. The three principal nadis are the ida on the left, the sushumna in the centre, and the pingala on the right; they run from the base of the spine to the head. The nadis play a role in yoga, as many yogic practices including shatkarmas, mudras and pranayama are intended to unblock the nadis and force prana into the sushumna nadi, enabling kundalini to rise, thus bringing about moksha, liberation. Nadi is an important concept in Hindu philosophy, mentioned and described in the sources, some as much as 3,000 years old. The number of nadis of the human body is claimed to be up to hundreds-of-thousands and even millions. The Shiva Samhita treatise on yoga states, for example, that out of 350,000 nadis 14 are particularly important, and among them, the three just mentioned are the three most vital. The three principal nadis are ida, pingala, and sushumna. Ida (इडा, iḍā "comfort") lies to the left of the spine, whereas pingala (पिङ्गल, piṅgala "tawny (brown)", "golden", "solar") is to the right side of the spine, mirroring the ida. Sushumna (सुषुम्णा, suṣumṇā "very gracious", "kind") runs along the spinal cord in the center, through the seven chakras. When the channels are unblocked by the action of yoga, the energy of kundalini uncoils and rises up the sushumna from the base of the spine. 3.6 "In the heart verily is Jivātma. Here a hundred and one nāḍis arise. For each of these nāḍis there are one hundred nāḍikās. For each of these there are thousands more. In these Vyâna moves." In yoga theory, nadis carry prana, life force energy. In the physical body, the nadis are channels carrying air, water, nutrients, blood and other bodily fluids around and are similar to the arteries, veins, capillaries, bronchioles, nerves, lymph canals and so on. In the subtle and the causal body, the nadis are channels for so called cosmic, vital, seminal, mental, intellectual, etc. energies (collectively described as prana) and are important for sensations, consciousness and the spiritual aura. Yoga texts disagree on the number of nadis in the human body. The Hatha Yoga Pradipika and Goraksha Samhita quote 72,000 nadis, each branching off into another 72,000 nadis, whereas the Shiva Samhita states 350,000 nadis arise from the navel center, and the Katha Upanishad (6.16) says that 101 channels radiate from the heart. All nadis are said to originate from one of two centres; the heart and the kanda, the latter being an egg-shaped bulb in the pelvic area, just below the navel. The Ida and Pingala nadis are sometimes in modern readings interpreted as the two hemispheres of the brain. Pingala is the extroverted (Active), solar nadi, and corresponds to the right hand side of the body and the left hand side of the brain. Ida is the introverted, lunar nadi, and corresponds to the left hand side of the body and the right hand side of the brain (there is a contralateralization). These nadis are also said to have an extrasensory function, playing a part in empathic and instinctive responses. The two nadis are believed to be stimulated through different Pranayama practices, including nadi shodhana, which involves alternately breathing through the left and right nostrils, which would theoretically stimulate the left and right sides of the brain respectively. The word nadi comes from the Sanskrit root nad meaning "channel", "stream", or "flow". Special breathing techniques are practised to influence the flow of prana within these nadis. According to this interpretation, these techniques purify and develop these two energetic currents and may lead to the awakening of kundalini. Ida is associated with lunar energy. The word ida means "comfort" in Sanskrit. Idā has a moonlike nature and feminine energy with a cooling effect. It courses from the left testicle to the left nostril and corresponds to the Ganges river. Pingala is associated with solar energy. The word pingala means "tawny" in Sanskrit. Pingala has a sunlike nature and masculine energy. Its temperature is heating and courses from the right testicle to the right nostril. It corresponds to the river Yamuna. The Ida and Pingala nadis are often seen as referring to the two hemispheres of the brain. Pingala is the extroverted, solar nadi, and corresponds to left hemisphere. Ida is the introverted, lunar nadi, and refers to the right hemisphere of the brain. Ida nadi controls all the mental processes while Pingala nadi controls all the vital processes. Sushumna interpenetrates the cerebrospinal axis, and in swara yoga is associated with both nostrils being open and free to the passage of air. The lunar channel Ida is pale in color and located on the left side. It is associated with feminine attributes, the moon and an open left nostril. The solar channel Pingala is red in color and located on the right side. It is associated with masculine attributes, the light of the sun, and an open right nostril. Sushumna connects the base chakra to the crown chakra. It is important in Yoga and Tantra. In Raja Yoga or Yoga of Patanjali, when the mind is quietened through Yama, Niyama, Asana and Pranayama, the important state of Pratyahara begins. A person entering this state never complains of Dispersion of Mind. This is characterized by observing the movements/jerks in sushumna in the subtle body. The medieval Sat-Cakra-Nirupana (1520s), one of the later and more fully developed classical texts on nadis and chakras, refers to these three main nadis by the names Sasi, Mihira, and Susumna. In the space outside the Meru, the right apart from the body placed on the left and the right, are the two nadis, Sasi and Mihira. The Nadi Susumna, whose substance is the threefold Gunas, is in the middle. She is the form of Moon, Sun, and Fire even water also; Her body, a string of blooming Dhatura flowers, extends from the middle of the Kanda to the Head, and the Vajra inside Her extends, shining, from the Medhra to the Head. The practices of yoga work together to force prana into the central Sushumna channel, allowing kundalini to rise, leading to moksha, liberation. The shatkarmas purify the nadis, while the mudras trap prana, and other practices (not shown) force the prana out of the Ida and Pingala channels. The purpose of yoga is moksha, liberation and hence immortality in the state of samadhi, union, which is the meaning of "yoga" as described in the Patanjalayayogasastra. This is obstructed by blockages in the nadis, which allow the vital air, prana, to languish in the Ida and Pingala channels. The unblocking of the channels is therefore a vital function of yoga. The various practices of yoga, including the preliminary purifications or satkarmas, the yogic seals or mudras, visualisation, breath restraint or pranayama, and the repetition of mantras work together to force the prana to move from the Ida and Pingala into the central Sushumna channel. The mudras in particular close off various openings, thus trapping prana and directing it towards the Sushumna. This allows kundalini to rise up the Sushumna channel, leading to liberation. Other cultures also work with concepts similar to nadis and prana. Systems based on Traditional Chinese Medicine work with an energy concept called qi. Qi travels through meridians similar in description to the nadis. The microcosmic orbit practice has many similarities to certain Indian nadi shuddha (channel clearing) exercises and the practice of Kriya Yoga. Tibetan medicine borrows many concepts from Yoga through the influence of Tantric Buddhism. One of the Six Yogas of Naropa is a cleansing of the central channel called phowa, preparing the soul to leave the body through the sagittal suture. The Vajrayana practice of Trul Khor is another practice used to direct and control the flow of energy within the body's energetic meridians through breath control and physical postures. Sometimes the three main nadis are related to the Caduceus of Hermes: "the two snakes of which symbolize the kundalini or serpent-fire which is presently to be set in motion along those channels, while the wings typify the power of conscious flight through higher planes which the development of that fire confers". ^ a b c d e f B. K. S. Iyengar (2010). Light on Pranayama. the Crossroad Publishing Company. pp. Chapter 5: Nadis and Chakras. ^ a b c Mallinson & Singleton 2017, pp. 172–173. ^ For reference to Chandogya Upanishad 8.6.6 and interpretation as an early form of the occult physiology see: McEvilley, Thomas. "The Spinal Serpent", in: Harper and Brown, p.94. ^ Nāḍikās are small nadis. Udâna are often translated as "out-breathing" in this context. Perhaps a metaphor for death. ^ Prasna Upanishad, Question 3 § 6, 7. ^ Mallinson & Singleton 2017, pp. 4–6, 323. ^ a b c d Mallinson & Singleton 2017, pp. 178–181. ^ Mallinson & Singleton 2017, pp. 228–233.